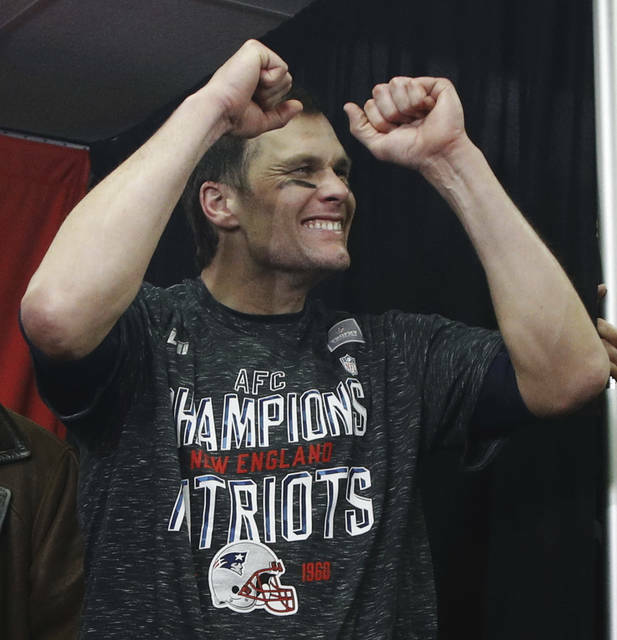 Yes, the Patriots won in Kansas City thanks to four critical calls going New England’s way in the fourth quarter, three of which were iffy: a replay reversal of Julian Edelman’s muffed punt , a phantom roughing-the-passer call on Chris Jones and Chris Hogan’s drive-sustaining one-handed catch with a little help from the ground. The fourth flag was indisputable: Dee Ford lined up in the neutral zone, negating rookie cornerback Charvarius Ward’s game-clinching interception with 55 seconds left and Kansas City ahead 28-24. Just like the Saints did when Tommylee Lewis blatantly was interfered with inside the Los Angeles 5-yard line by Robey-Coleman, whose helmet-to-helmet hit didn’t draw the flag but will surely result in a hefty fine. “I thought it was a flag for that split second,” acknowledged Robey-Coleman, who was as surprised as everyone else when two officials near the play ruled it an incomplete pass on third down with 1:45 remaining in regulation and the game tied at 20. “I knew if that had been a flag, they probably would have scored on the next play,” Robey-Coleman said. The league has never invoked the rule to reverse a game’s outcome. The George Halas and Lamar Hunt Trophies may be smudged amid the backlash over the officiating gaffes, but they aren’t entirely tarnished because strategy and execution had as much to do with the outcomes of these overtime thrillers as the yellow flags that were or weren’t thrown. The Rams (15-3) roared back from a pair of double-digit deficits to beat the Saints 26-23 in overtime because they stuck with the plan and didn’t panic after falling behind 13-0 in the first quarter and 20-10 in the third quarter. 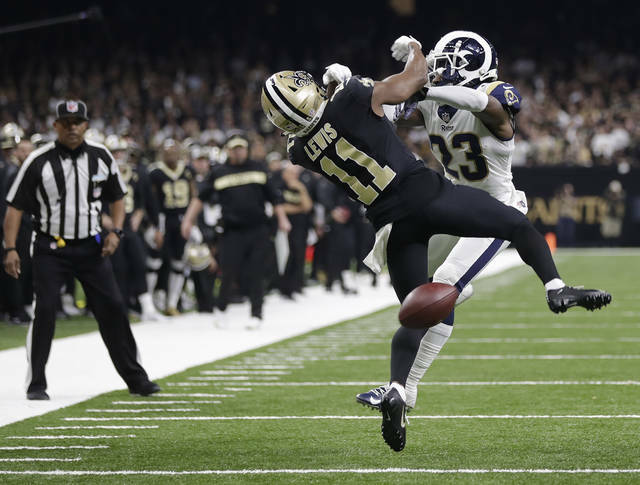 After managing just 5 yards in the first quarter when nothing went right, the Rams righted themselves thanks to a fake punt and cut New Orleans’ lead to 13-10 at halftime. 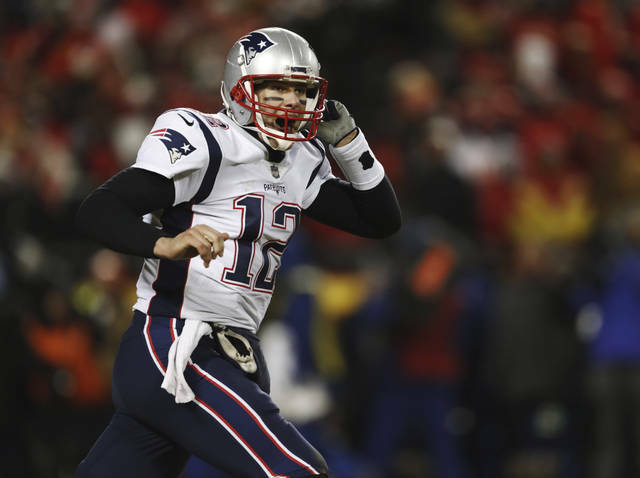 The Patriots (13-5) overcame a 24-point fourth-quarter outburst fueled by Patrick Mahomes to beat the Chiefs 37-31 in overtime because Tom Brady was hardly touched, aside from Jones’ shoulder swipe that the officials thought hit him in the facemask. New England’s much-maligned offensive line didn’t allow a single sack to the Chiefs, whose 52 sacks during the regular season were tied with the Steelers for the league lead and who pummeled Andrew Luck a week earlier, sacking him three times.